From the creator of the wildly popular Welcome to Night Vale podcast comes a story about loving, about searching - and about the courage you need when you find the unexpected. For fans of Stephen King, Serial, Twin Peaks and of course the eponymous number one iTunes podcast itself. Keisha Lewis mourned the loss of her wife, Alice, who disappeared two years ago. There was a search, there was grief beyond what she thought was possible. There was a funeral. But then Keisha began to see her wife, again and again, in the background of news reports from all over America. Alice isn’t dead. And she is showing up at the scene of every tragedy in the country. Keisha shrugs off her old life and hits the road as a trucker - hoping on some level that travelling the length of the country will lead her to the person she loves. What she finds are buried crimes and monsters (both human and unimaginable), government conspiracies, haunted service stations and a darkness far older than the highway system it lies beneath. 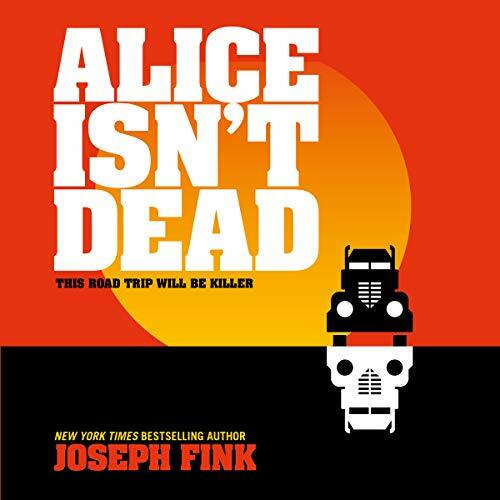 Inspired by the eponymous podcast, Alice Isn’t Dead is a story about loving, about searching - and about the courage you need when what you find is terrifyingly unexpected. Cast in the fluorescent lights of midnight diner signs, this story is as big as the open road and as intimate as the darkness of a trucker’s cab: perfect for fans of Stephen King, Serial, Twin Peaks and American Gods. Completely brilliant story, twists and turns with a wonderful sombre ending. Teaching forgiveness and that being yourself and being scared is perfectly okay. I particularly loved Fink's postscript on his own anxiety. thank you. podcast is also recommended. I loved Alice Isn't Dead. From the beginning confusion right up until the very satisfying end, Joseph Fink and Jasika Nicole made the characters believable and lovable. Despite the fantastic nature of the story, the characterisation made the book very believable.